Nicola Sturgeon is more interested in pushing for independence than she is in finding a solution to Brexit, the Scottish Conservatives have claimed. All 35 SNP MPs abstained in a Commons vote on whether there should be customs union with the EU after Brexit. Tory interim leader Jackson Carlaw said the SNP had "refused to back the very option they have been demanding" and accused Ms Sturgeon of "faux outrage". Ms Sturgeon said remaining in the EU must now be the top priority. And she said her party would continue to "stand up for Scotland's interests" by pushing for another referendum on EU membership. The exchanges in the Scottish Parliament came the day after MPs at Westminster failed to find a majority for a way forward after voting for eight different Brexit options on Wednesday evening, leaving the process in deadlock. The customs union option would have been successful if the SNP had voted for it instead of abstaining. Speaking during first minister's questions, Mr Carlaw said that "when push came to shove for the SNP it's not about finding a solution to Brexit, it's about pursuing their independence obsession". He said: "There was no principle in the way the SNP voted last night. What I saw in contrast was a prime minister prepared to set aside her own premiership to secure a deal which, contrary to everything the SNP says, will be good for Scotland and will be good for the UK." Theresa May has said she will stand down as prime minister if her withdrawal deal is accepted, which has secured some further support for her plan but it still opposed by the DUP and some other Brexiteers. Ms Sturgeon predicted immediately after the prime minister's announcement that her departure would make the Brexit process "even worse" and "further reinforce" the case for independence. Mr Carlaw said Ms Sturgeon's comments had displayed her "faux outrage, grievance and her own single minded obsession" and asked: "Aren't Scots right to detect just a little bit of a pattern here?" He also said Mrs May's deal was the "only credible way forward", and was supported by Scotland's business leaders, whisky and fishing industries. He said: "Surely after all the confusion, with every other alternative being rejected yesterday, the national interest is served by supporting that compromise? Surely it's time to back the deal and get on with it?" In response, Ms Sturgeon pointed out that Scottish Secretary David Mundell abstained in all eight of Wednesday's votes. And she said the SNP had spent two years arguing for membership of both the customs union and single market after Brexit - which was not an option that was on the table in the Commons votes. Ms Sturgeon told him: "For two long years when stopping Brexit didn't seem possible the SNP argued for single market/customs union membership compromise. That was ignored by the Tories and indeed everybody else. Ms Sturgeon said the process of leaving the EU was now "such a mess" that "stopping Brexit altogether must be our top priority". The first minister added: "Theresa May must be the only leader in living memory who has tried to fall on her own sword and has managed to miss - it is utterly ridiculous. "The SNP, in contrast to the Tories, will continue to stand up for Scotland's interests. That's what we have done since day one after the Brexit referendum. "The way to stand up not just for Scotland's interests but for the interests of the entire UK right now is to recognise that this Brexit process is a complete and utter mess and put this issue back to the people." Two SNP MPs - Angus MacNeil and Pete Wishart - rebelled by abstaining in a vote on whether there should be another EU referendum. The rest of the party's MPs voted in favour of the proposal. 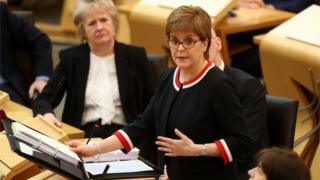 The Scottish Parliament voted by 89 to 28 on Wednesday for a motion calling for Article 50 to be revoked as a last resort, if it is the only alternative to a no-deal Brexit. It has now emerged through an FOI request that the UK government has paid £146,381.13 on counsel fees and court fees in connection with the case. The figure does not include expenses of the petitioners or the additional parties, which will be settled and paid in due course. They will vote on the withdrawal agreement - covering the "divorce bill", citizens' rights and the controversial Irish "backstop", but the political declaration covering the UK's future relationship with the EU will not be put to the vote.